Perhaps. I admit I often feel dizzy, and some conclusions of conversations like that sometimes escape my attention. My short-term memory suffer from some issues I don't want to explain. Still my artistic freedom is valid in this case and any other. 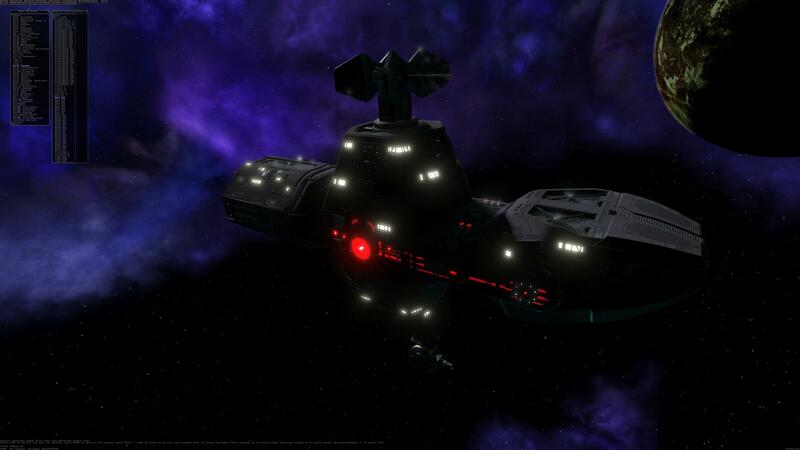 As Nightmare stated, my ships are "shiny" so they follow my distinctive style of modelling and texturing. MVPs are a healthy mix of Mixael's rough and specular-focused texturing, Oddgrim's pastel, digital-painted vasudans, VA's over-greebling, Sab0o's simplicity and Hades' tricky shapes. My shiny-ness contribute to the family. Which ships? Leviathan is the only PBR terran ship in current MVPs. I read Fenris as bare-metallic and in my opinion it fits to this ship. I added gray painting as you requested and I think it works. I will listen to your feedback as I used to listen others but I follow no guidelines when there are none. And there is nobody to give me such. I don't want sound rude. I value your opinion, I value community feedback and I respect you personally for everything you do here. Anyway FSU is community project and Fenris is my contribution. I want to contribute more and I have power to do it, but I don't want to be limited by anything at all. Hey, someone will always get finicky when new MVP assets are made, For the record, I really love your metallic shiny stuff, I just did not think it was consistent for the Fenris with the rest of the MVPs. Feedback is just one of those things everyone has to deal with in life. While I agree that you should have some artistic freedom, what you have made here doesn't contribute so much as add noise to everything. All the Terran ships look verifiably Terran when lined up together except your Fenris. It's basically grungy gray, brown, green, and blue paint for everything else then the Fenris comes in looking like a mirror. Ships being PBR or not isn't what matters, there's an aesthetic that each faction in FreeSpace have. For Terrans, it's the aforementioned grungy paint, Vasudans have semi-organic shapes with lots of yellows, oranges, and some browns, Shivans are dark, mechanical yet insectoid with red glows. I really didn't want to be that guy, but I just don't think your style as is works for the Fenris. I want to see the surface detailing properly and actually get a good idea of the ships overall appearance, you've basically gone and masked any beauty it had with mirror-like surfaces. Why hasn't this been highlighted yet? Yeah it's a cracking ship. The shininess is authors preference and I for one am grateful for the effort. It's not a hard correction for anyone wishing to include it in a mod. It's so shiny it can highlight itself. If you don't like how mirror-shiny this ship is (which I don't), you guy understand that changing that only takes a couple of minutes and a free paint.net plugin, yes? It's really not hard. Well, about the shiny-ness... well, for me it look more that this ship was wrapped in aluminum foil, do not see any metal in it. But nevertheless, i have some small other nitpicking with it: I think the nameplate is placed too much to the left, because even short ship names begin at the join instead on the empty area of the hull. Someone's been polishing these Fenrises, I see. They may explode when looked at, but at least they'll look shiny when doing so goddammit! After quite a while its nice to see progress. I just wish Demon gets some love like this too. Unfortunately, FenrisGreeb is not neatly separated into painted and dark parts so I left it completely untouched. The diffuse map looks kind of rough but it has a real presence that no non-PBR ships possess. I think a real artist would be required to "paint" it properly, adding a sense of physicality and weathering to the paint, etc. 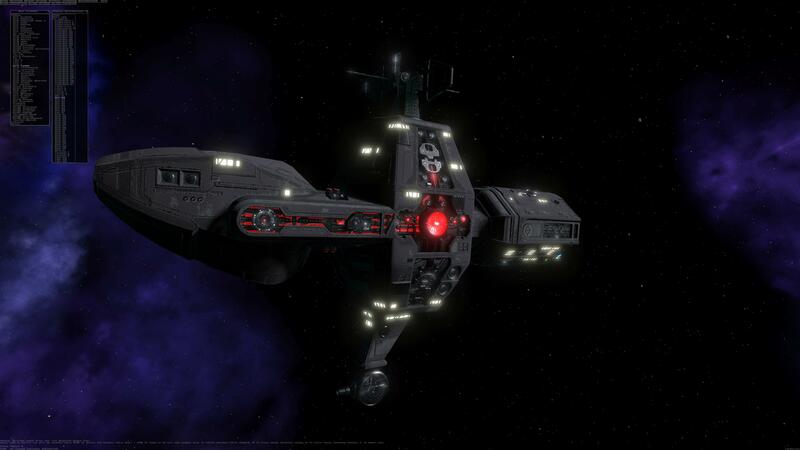 Perhaps one could have easily gotten the impression that Terran ships were shiny metal from the way textures designed without specularity in mind tended to get adapted to specularity. They "should" have been redrawn from scratch, but unfortunately the dev time and resources did not exist and especially capship tiles tended to end up at the bottom of the food chain in this regard. Instead, people twiddled with some sliders or applied crude blending techniques (sort of like what I just did ) to get it looking mostly acceptable. The TEI fleet in Blue Planet seems like it was always meant to be silvery metal instead of gray, so that's another possible source for the shiny Terrans brain bug. Even in its damaged state, this is the best-looking FSU model that's ever been released. Perhaps the bare metal skin could even be kept and made a GTI variant or something. There's a face on the side of it above the red glowing thing. This also looks pretty good too!